Vlad Taltos is a mobster and assassin in the magical metropolis of Adrilankha. A member of the Great House of Jhereg (named for the tiny dragon-like creatures native to Dragaera), Taltos is given the largest contract of his career but the job is even more complicated than he expects. The first book in Stephen Brust's "Vlad Taltos" series, Jhereg has also been adapted into a graphic novel by Marvel Comics. Here, Bernard Setaro Clark brings the tale to life in a rousing performance. ©1983 Steven K. Z. Brust (P)2012 Audible, Inc. The book of Jhereg is something of a detective story in the midst of a fantasy world of dragons, elves, and of course humans. It follows the antics of wise-cracking assassin Vlad Taltos and his dragon-like companion, called a jhereg, in the Dragaeran city of Adrilankha. Vlad Taltos is human; he is also a mobster and assassin and is the narrator of the book; for those familiar with the Dresden Files, he loosely reminds me of Harry. Jhereg is book one of a series in which the writer, Steven Brust creates a very credible fantasy world. Originally published in 1983, I was curious to hear how it would sound in audio format and was pleased; I thought the narrator, Bernard Setaro Clark, gave a good performance bringing the characters to life. I would recommend this series for those who like this type of genre. There is nothing heavy or terribly intricate about Brust's creation--just a diverting tale set in a well constructed world with characters it is easy to cheer for. Often it is predictable, but it never lags or confuses. Sometimes inconsequential fluff is a wonderful change of pace when it is served with sufficient style and good humor and a sizable helping of clever repartee. I am coming to this series late, but now that I have found it, I know where to go when I just need a lighthearted fantasy adventure/mystery as a break from a grueling foray into the likes of Brandon Sanderson or Cormac McCarthy. Satisfying in very different ways. If that is a genre, Steven Brust's first Vlad Taltos novel, Jhereg (1983), is a progenitor. Vlad Taltos, the hardboiled but sensitive first person narrator, is a 21-year-old assassin-spy security-chief crime-boss skilled with blades, conversant with poisons, expert with witchcraft, and bonded with a telepathically impudent but faithful familiar, a dragon-like scavenger jhereg named Loiosh. Humans like Vlad are a second-class minority in the City of Adrilankha among the dominant Dragaerans who possess life spans lasting thousands of years, tall bodies (7-foot average), and elvish features. The Dragaeran empire is at least 250,000 years old and is divided among 17 Houses named after and sharing the traits of dragons, hawks, jheregs and other animal species of their world. Despite being a human, Vlad is successful in the "business" wing of House Jhereg, and he has powerful friends in House Dragon. He has killed 41 people, but most of them deserved it and were revivified (as he himself has been), and there's always reincarnation, so we don't feel TOO uncomfortable about his profession. 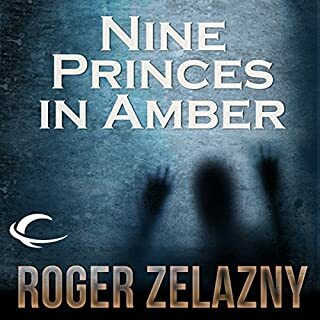 In the first chapter, Vlad is hired by a high-ranking House Jhereg Council member to find an ex-Council member who just embezzled and absconded with nine million imperials. If he isn't killed within a few days, House Jhereg, founded on projecting a tough criminal image throughout the Empire, will become permanently and devastatingly known as a soft robbery target. Where is the culprit hiding? What is his background? What is he really up to? To have any chance at solving the mystery, Vlad will need to call on his friends and minions, experts in thievery, psionics, spying, magic, assassination, and the like. "There is no substitute for good manners, except fast reflexes." "No matter how subtle the wizard, a knife between the shoulder blades will seriously cramp his style." 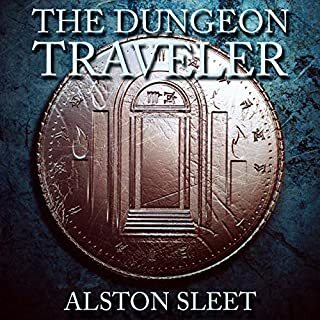 As we read this novel, we learn about the history of Vlad, the Empire, and a few of the Houses, the nature of human witchcraft and fencing versus Dragaeran sorcery and heavy blade work, the assassin profession, and so on. The short book packs an impressive number of concepts, like the "Morganti," semi-sentient soul-eating blades a bit like Elric's Stormbringer but divided up into a host of daggers and swords of varying degrees and types of power, sentience, and ability, the greatest of which bond with the souls of their wielders and decide whether or not to eat their victims' souls. 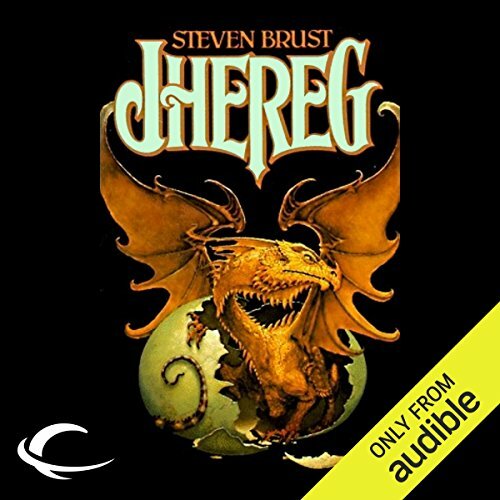 Although Jhereg is a self-contained story, Brust leaves plenty of room for future and past developments in succeeding novels with the different Houses, magic, religion, Vlad's friends, familiar, and identity, and (I hope) the difference in human and Dragaeran life spans. Vlad mentions things like a Dragaeran "girl" being "only" between 100 and 800 years old, but never how he feels to be short lived relative to the Dragaerans. None of his Dragaeran friends and colleagues ever mentions how young and soon to die Vlad is compared to them. Aren't they already missing him? Aren't they bored with their long lives? Why doesn't anyone talk about this kind of thing? Brust's people speak much contemporary American English: "What's up?" "Let's get out of here." And "Take it easy." That makes the strange world feel familiar, but often the writing sounds corny or flat, as when Vlad says, "Crap. Double crap. Dragon dung." Or "The question at that point wasn't should I press, or even how much I should press. It was rather how should I press. I decided to continue the game I'd started." There are some funny lines, though, as when Vlad's familiar Loiosh disparages cat petting: "Hey boss, isn't it disgusting how some people cater to the whims of dumb animals?" Vlad's self-directed irony is often funny, too, as when he gives "general pointers on assassination" like "Do not have yourself teleported so that when you arrive at the scene, you are feeling sick to your stomach." Reader Bernard Setaro Clark's Dragaerans all speak a soft pseudo-British accent, his humans straightforward American English, though his Vlad has a nearly irritating tendency to elongate his long vowels: "Seven inches of blaaaade." I do like Clark's Peter Lorrie-like Loiosh: "Can I eat him, boss?" In its genre fusing, humorous dark fantasy, Jhereg points the way towards series like the Dresden Files by Jim Butcher and The Malazan Book of the Fallen by Steven Erikson. It is an entertaining novel, with exciting action and a world of great potential, but this first book in the series is not SO funny, stimulating, or stylistically rich. First penned in 1983, this underrated series of books is finally making its way to Audible. I know - I was one of the underraters. I've loved science fiction and fantasy since I could read, so we're talking half a century, and yet, I never could get past the covers of certain books. Tragic but true. I saw these novels on the bookshelf, and I didn't connect with the back cover brief, nor the garish covers (Sorry, Steven). I was, and sometimes still am, prejudice in that way. During my lifetime, I HAVE often stepped out and acquired many unknown author's books, and have been both happily rewarded and nightmarishly punished. Look at my numbers and reviews here at Audible. I finally did acquire Jhereg: Vlad Talos, the first audiobook in the series. I should have read these books a long time ago. Mix swords, sorcery, and assassination with a European feel. Now, add a dash of machiavellian intrigue, and this is Brust's series, plain and simple. Exceptional character creation and interaction, twists, turns, and good narration. It all comes together for the truly enjoyable audiobook, and I can't sing it's praises highly enough. Am I going to give anything away as to the plots, characters, creatures and tonality? If you look at my other reviews, I rarely if ever do that for good works of writing - It's not fair to you, the reader/listener. If a book or series is exceptional, it's because of the voyage of discovery. This is, simply put, good writing. Don't do like I did. Don't miss out for so many years on a great series worthy of your Audible credits, time, and appreciation. Get the first book, and listen and judge for yourself. And you'll probably buy the rest of the books. Steven, I can admit when I'm wrong, and this is the case in this great first book in the series. I'll be making up for the lost time by acquiring the remainder. Originally posted (with links) at FanLit. Audio readers, rejoice! 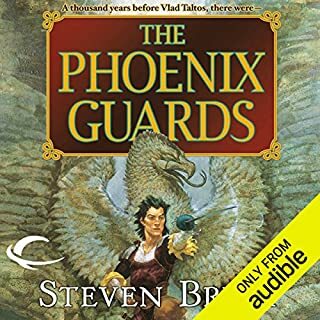 Finally, Steven Brust’s VLAD TALTOS novels have been produced in audio by Audible Frontiers. For years I’ve been planning to read this long series and have only been waiting for this moment. The VLAD TALTOS novels follow Vlad Taltos, a well-known and highly successful human assassin living on the planet Dragaera. The native species, the Dragaerans, are a tall long-lived race created by sorcerers who cross-bred humans and certain animals. The characteristics of the animals give each clan, or “House,” its name, physical features, and personality traits. The exception is the house of Jhereg (named after a small dragon-like creature) which is a low-class conglomerate of outcasts from other clans and also any true humans who can buy their way in, which is what Vlad Taltos’ father did. Each of Brusts’ novels in this series is named after one of the Dragaeran houses. In this first installment, Jhereg, we meet Vlad Taltos and his familiar, Loiosh, the jhereg who can communicate with him through mind-speech. Vlad has been hired to kill a councilman named Mellar who has embezzled a huge sum of money from the Jhereg council. When Vlad catches up with Mellar, he discovers him hiding out in Castle Black, the floating mansion of Vlad’s friend, the Dragonlord Morrolan. Castle Black’s rule of hospitality is that anyone who has been invited to stay at the castle cannot be touched and nobody wants to violate this law because it would ignite another Dragon-Jhereg war. The last war devastated both houses. Vlad and Loiosh must flush out Mellar without offending a Dragonlord or starting a war. This is not an easy task and Vlad will need to solve a mystery and get a little help from his friends. Jhereg is appealing for several reasons. Vlad Taltos is a great character — the sort of honorable criminal that you can’t help but like. It helps that in Brust’s world, an assassination isn’t necessarily permanent. People can be revivified if their body is still mostly intact and they haven’t had their soul destroyed by a Morganti weapon (somewhat like Elric’s sword). Vlad is clever and must use his brain, not just his weapons or witchcraft, to solve his dilemma (though I thought he solved the convoluted mystery a little too easily). Vlad’s friends are also likeable, especially Loiosh the familiar, Vlad’s wife (who he met when she tried to kill him), and a female Dragonlord. Brust’s female characters are strong, smart, and competent. Audible Frontiers’ version was narrated by Bernard Setaro Clark. He was terrific, speaking with a lively manner and giving each character a pleasant and distinct voice. 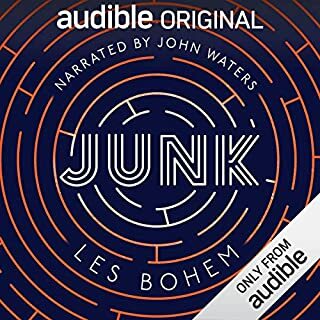 As usual, I had to speed up the narration a bit (I’m beginning to suspect that Audible has purposely slowed down their narrators). I’m pleased to see that Bernard Setaro Clark has also narrated the sequels and I’ll be picking up book 2, Yendi, which is actually a prequel to Jhereg, very soon. I look forward to spending more time with Vlad Taltos. Yes. Steven Brust presents an hierarchical world, based on genetic associations with fantastic animals, through the eyes and mind of Vlad Taltos, a human hero of sorts (he is an assassin, after all) in a society that ranges from arrogant haves to criminal have-nots (the criminals are more fun), with humans the ultimate underdogs. Subterfuge and intrigue, spiced with magic and sorcery (not the same in this world), sneaky violence and bold mayhem in a medieval-ish setting with colorful characters and swashbuckling action. What could be better? I read much of the series years (and years) ago. A rerun in audible form is most satisfying, and with Bernard Setaro Clark's reading, my memory of the tale comes to life in a most entertaining voice. I was first drawn to the story by the concept of the mental connection between the human Vlad and his jhereg Loiosh, a small winged reptile companion/bosom buddy with a smart mouth, psionically speaking. I had read Anne McCaffrey's Dragonriders of Pern for much the same reason. With Brust, I get to enjoy the sarcasm and snarky comments that pepper the mental connection and often end with, "Shut up, Loiosh." Bernard Setaro Clark captures the various voices very well. The jhereg a slight accent, boredom or contempt is nearly tangible in the tones of some Dragaeran characters; in short, each is distinct and notable. Good job. Smart, witty and full of intrigue. What did you love best about Jhereg? The author throws you into a world that is fully realised and slowly reveals the details. What was one of the most memorable moments of Jhereg? What about Bernard Setaro Clark’s performance did you like? Bernard did a tremendous job reading this book with wonderful pacing and atmosphere. I recommend this author to ANY fan of fantasy. 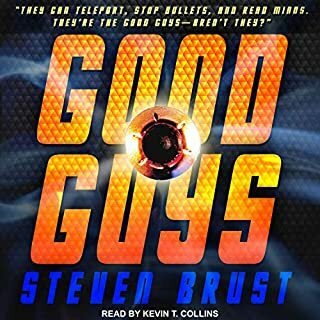 I've been a fan of Steven Brust's work for about twenty years and was quite happy when Audible released them. In particular the Vlad Taltos series have always been my favorites of his contributions to the fantasy genre. All of these books are quick paced, entertaining and extremely funny. Brust does an excellent job of telling stories revolving around an unconventional hero (a professional assassin) while allowing Vlad to remain human (i.e. someone who deals with the spectrum of human emotions, worries and fears) and demonstrating how he deals with these issues while carrying out his trade. If you haven't read/listened to any of Brust's work, the Vlad Taltos books is a great place to start. They bring out some of his best characteristics as an author. Warning: If you like ethnic Hungarian cuisine, some of Brust's depictions of food in his novels will make you extremely hungry. They are extremely detailed and descriptive. Brust should consider publishing a Vlad Taltos cookbook. Bernard Setaro Clark does an outstanding job with all thirteen of these books. I would be hard pressed to find fault with his work on any of them. Excellent job overall. The story was bit slow to get started, and even a bit to cheesy at the beginning. It did, however, start to move along a bit faster and it slowly drew me in and entertained me on a long drive. Although it reminded me of a Dungeons and Dragons saga, there were some novel concepts in the story, but I felt they we a bit undeveloped. Perhaps those parts were sacrificed to editing. If you like the Fantasy genre, you should be pleased with this book. It's nothing earth shattering, but it is entertaining enough to warrant a recommendation. If you could sum up Jhereg in three words, what would they be? When he frist bonds to the Jhereg at the start of the book. Have you listened to any of Bernard Setaro Clark’s other performances before? How does this one compare? This is the first one I have listened to from this narrarator. He did a good job. No this is a fun, easy read. If you like Glen Cooks garret PI sereies you will like this. It isn't deep but a fun action filled story. A fantastic book, read by a fantastic Narrator. A hidden gem of a story, that Bernard reads with thought and character, making what is a wonderful story even better.